Patara (patára) mean “small” in Georgian. And that is exactly what it is. A collaboration with a very famous Russian-Georgian movie director Rezo Gigienashvili, it represents what the small beautiful caucus state is about – hip, modern, creative but rooted in centuries long tradition of hospitality, love of food and warmth. Those who have visited this enchanted country know that its people are all about their guests and will give their last in order to ensure they treat you like royalty and make you feel most welcome. 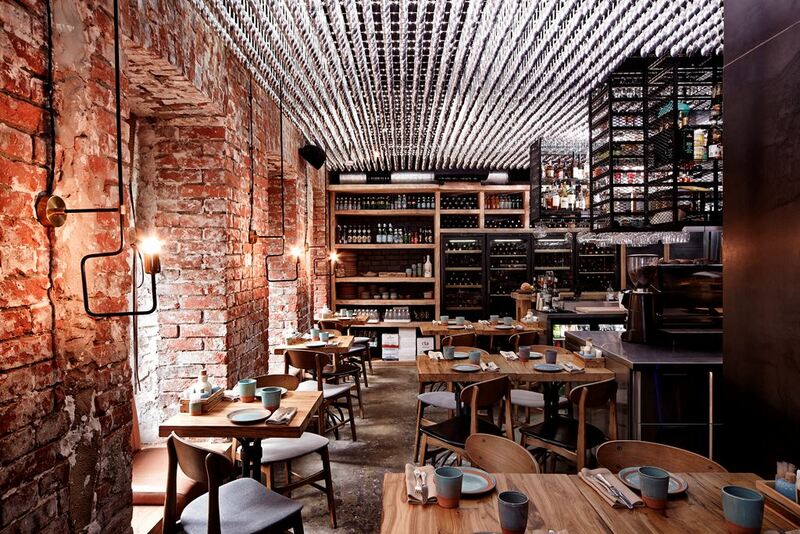 With a young, gorgeous chef from Tbilisi, who reinterpreted traditional Georgian cuisine with wit, creativity and the eye for modern tastes, this tiny eatery became the epicenter of bohemian scene with movie directors, actors, artists, musicians as well as the hip crowd occupying the mere 45 seats. 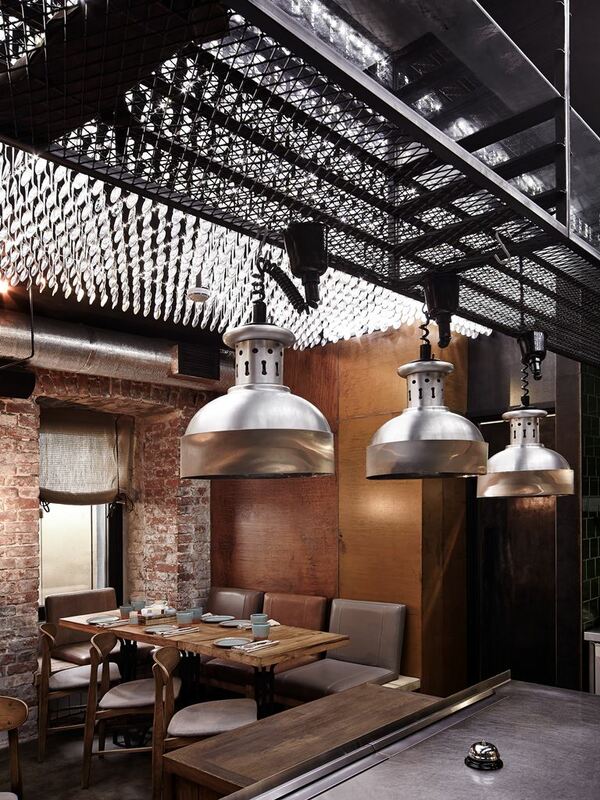 When we were creating Patara, it was important to me to emphasize the closeness and intimacy of the concept, and to that extent the mere 980 sq ft area was an advantage. I wanted to create the feeling of a traditional Georgian home without bric a brac esthetics. And apart from the obvious use of deeply textured, warm materials, rough woods and color schemes, we achieved this through space planning. Taking the idea of “open kitchen” far beyond comfortable restaurant boundaries, we fully intervened the seating areas with the kitchen, creating a feeling of a united space. 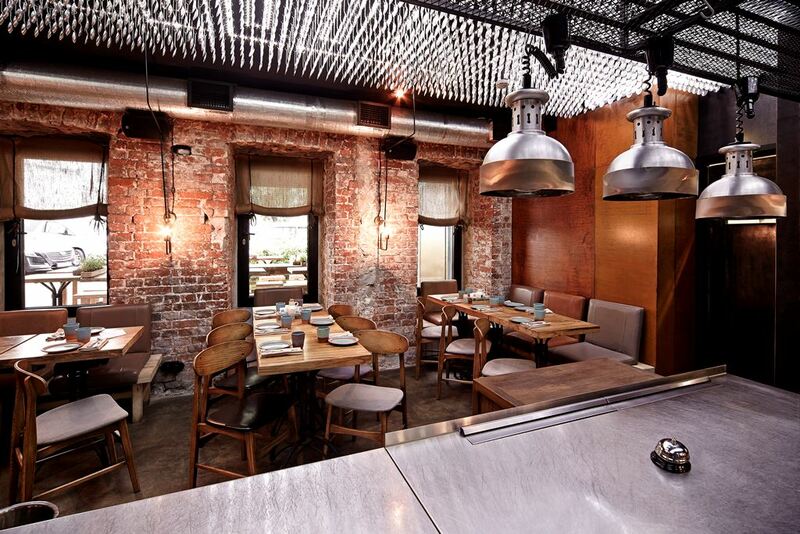 Just as you would eat in the kitchen at someone’s home, you do at Patara. Not only do guests see, smell and hear their food being prepared, but they interact with the chefs. So it is no surprise to see the chef, taking off his apron at some point in the evening, grabbing his guitar and joining a table for a little jam session. The whole atmosphere is very hip, laid back, spontaneous. Georgians are famous for their wines and their love of wine. And with such food and wholehearted atmosphere, it’s impossible not join in. The restaurant is located on Patriarchy Ponds, which is the equivalent of New York’s Williamsburg neighborhood harboring the city’s hippest restaurants, bars and boutiques. To reinforce the feeling of home like intimacy, and position our guests right in the middle of the space faced full on with our open integrated kitchen we made a very unconventional move. We relocated the restaurant entrance to the small arch on the side of the building. Thus the hustle and bustle of Patara very visible from the street through the floor length windows, but getting in remains a thoughtful quest. Once inside and through the heavy curly textured curtain, we are faced with the full embrace of the kitchen and greeted by all of its staff with a warm smile of an old friend. This is not a place for those who like their space. It is tight and busy and crowded even when u r the only guest. It blends all who are inside into one group, one organism, creating a unique atmosphere. The portions a hearty and expected to be shared. The space has no decor per se apart from one stark feature, with every other item being functional. 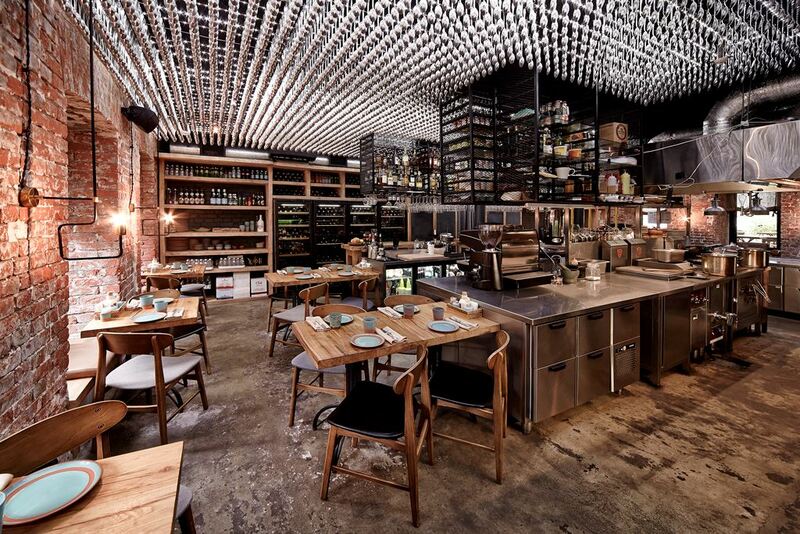 The shelves house the wines served to guests, the metal structures above open kitchen hold plates and other chef’s items. 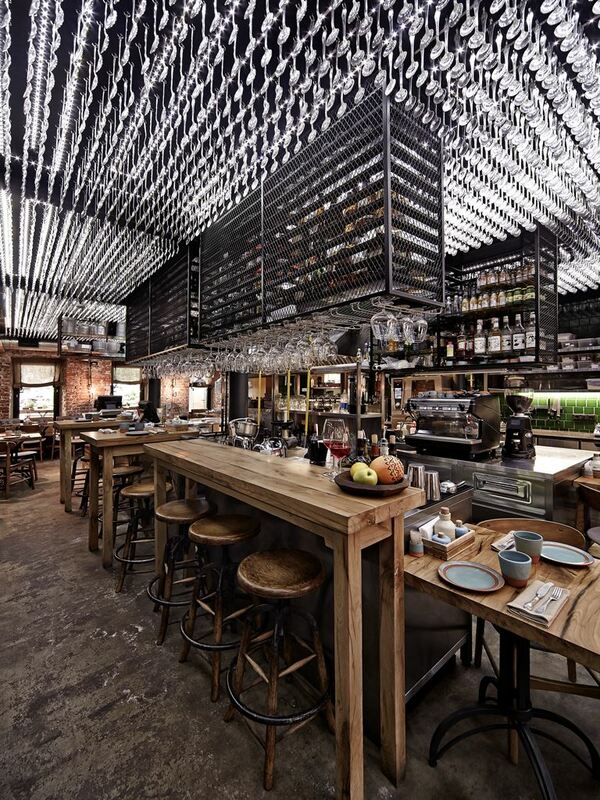 The one decorative feature is the ceiling, made of 12000 spoons and led lighting trails. 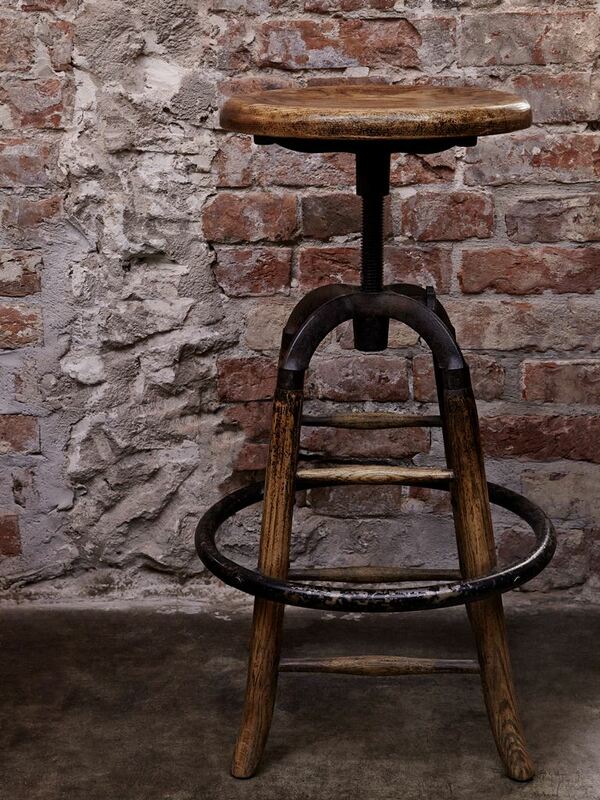 This is undoubtedly the most instagrammed feature in Moscow’s restaurant and a mesmerizing favorite with all guests. 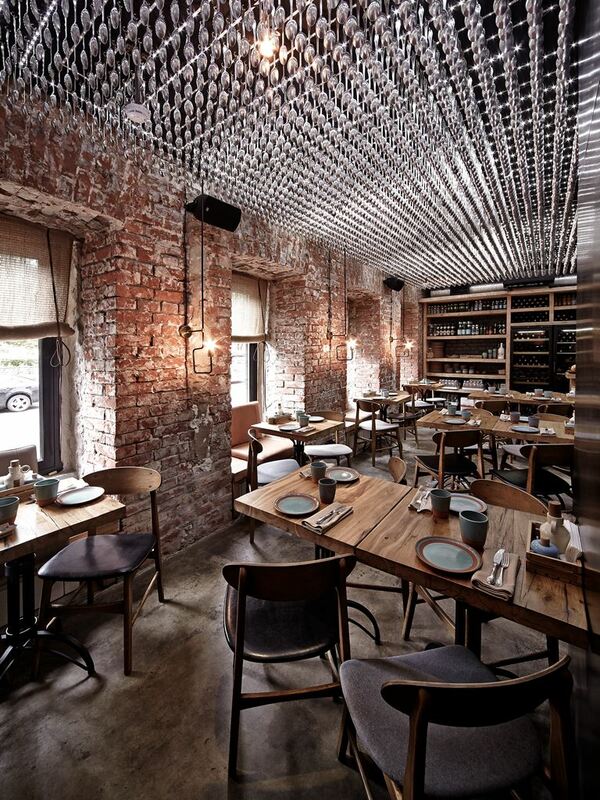 The light, reflected off metal, provides an ever changing brush of shadows upon the rough wooden tables and vintage brick walls. 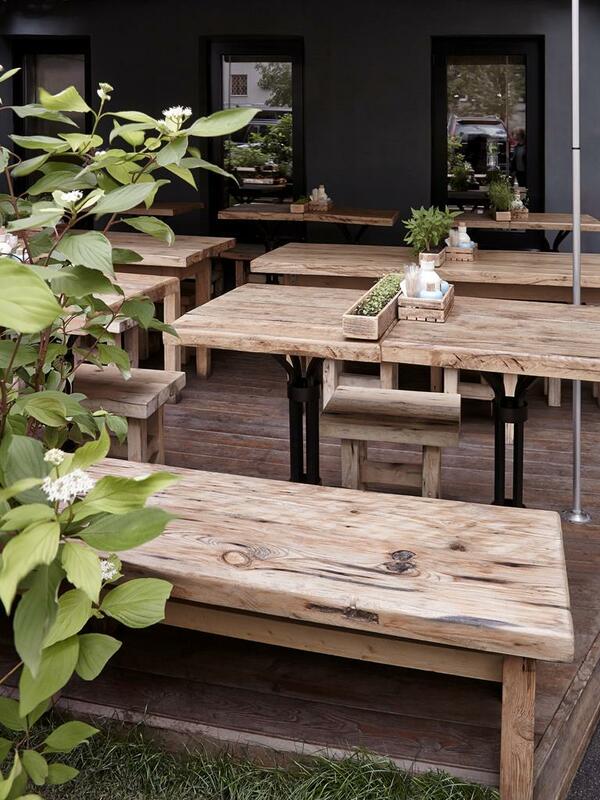 In the back yard, the restaurant has a small open air terrace of rough wooden communal tables and benches under the trees. Just as one would in Georgia. Everything in the restaurant was custom made to specifications and is unique to this project.